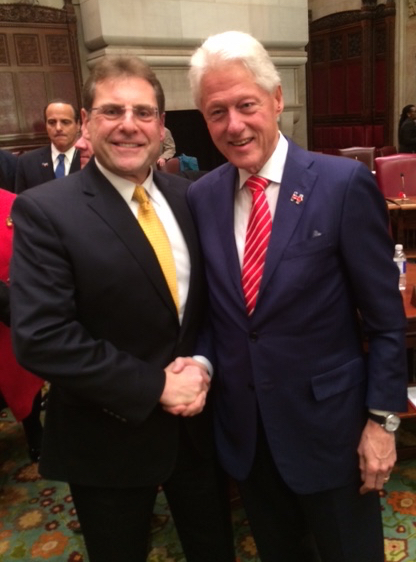 Columbia County Democratic Committee Chairman Peter Bujanow with former President William J. Clinton at New York State’s Electoral College in the Senate Chamber at the Capitol on Monday shortly after the former president cast his vote for former Secretary of State and First Lady Hillary Rodham Clinton. All of New York’s 29 Electoral College members cast their ballots for Hillary Clinton, who won Columbia County and New York State. The gathering of New York Electors had a bittersweet air as many acknowledged their disappointment in the national results. The Electoral vote counts on Monday will be sent to Washington, D.C. where they will remain under seal until January 6, when Vice President Joe Biden is expected to open the Electoral votes before a joint session of the new Congress where they will be officially counted.